I love traveling on roads that look like this. It's all about the lush greenery for me. Grass and trees and flowers. 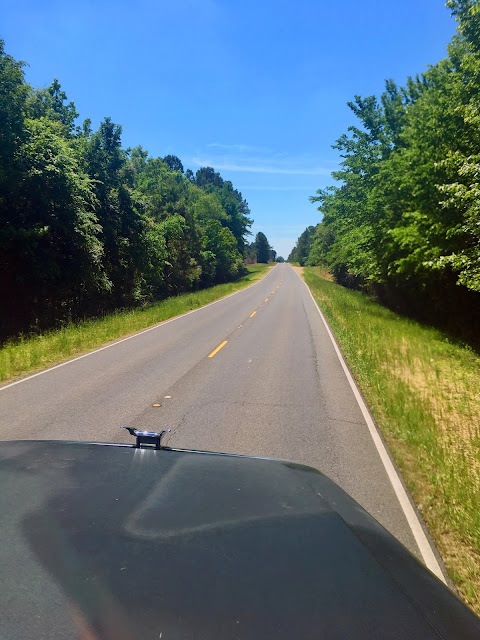 This photo was taken in central Arkansas on one of the secondary roads we took on our way to pick up a load. I live in the Southwest but I'm not at all a fan of the scenery there. In fact, I prefer the entire eastern half of the country over the western half. East of the Mississippi River, really. There are a few places west of the Mississippi, like Arkansas and Louisiana and the very eastern part of Texas that are acceptable, but I wouldn't lose sleep leaving those states out. And sure there are pretty pockets of mountains and stream and wide open spaces out west, but mostly, it's brown and depressing to me. I intensely dislike any desert-like landscape bathed in neutral tones or flat plains where there's nothing to see for miles but dead grass, shrubs, or cactus. But the scenery in a place like this, with tons of trees and the density of green (or in the fall, the colors of changing leaves) is what I love to look at. I can drive these roads all day long. My eyes transmit this beauty straight into the center of my being and it fills me with joy. We'll soon be doing another dedicated run through the southwest. I'm not happy about it, but I'm going to try to be positive about some of the perks it offers. I'm definitely going to miss the opportunity to see trees like this, the ocean like we just saw in North Carolina, and in a few months, the fall foliage and snow that will be coming. There may be a few changes coming to the blog also. As soon as I've decided what I'm doing, I'll let you know. In the meantime, Happy May Day! and have a great week!! 2013: No Pets. No Beards.